Improving the car for many car owners has always been a priority, a special role in this was given to the functionality of the car. Factory configuration even if they are the maximum, as a rule, leave much to be desired. Their cost is too high, and the functionality doesnt match the cost. With great pleasure, SMARTY Trend is pleased to inform you about our new Tesla receivers! These recorders are very popular among car enthusiasts not only because of their design, but also because of the enormous possibilities that become possible after installing this device. The first and perhaps the most visible advantage of Tesla-style SMARTY Trend devices is the diagonal of the main screen, which ranges from 10.4 to 16 inches. Working on the head unit has become even more comfortable, the resolution of the Full Hd screen, excellent viewing angles provide excellent image quality, in any light. There are also two night and day modes to maximize the brightness of the image. 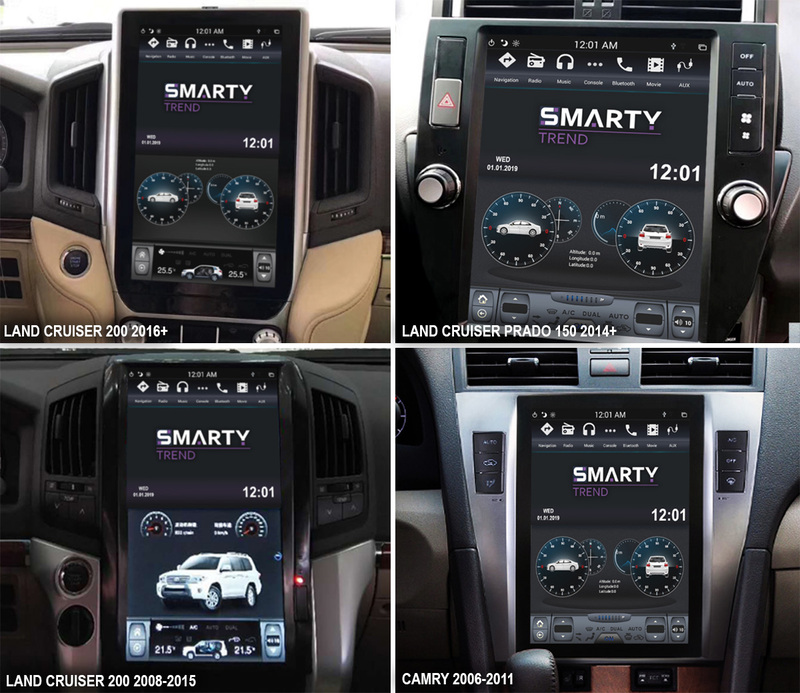 A very important factor is the installation of the head unit from the company SMARTY Trend in the style of Tesla. These devices are standard, that is, the device is designed specifically not only for this model of car, but also for this configuration. This means that despite the first impression that there is a hard work ahead, devices from SMARTY Trend are installed without problems. The connection is made to the connector to the connector, which minimizes all possible difficulties for installing the head unit. Depending on the make and model of the car, it may be necessary to install a special part of the front panel. It is included, and the quality of its performance is not inferior to the factory specifications. Support for regular functions is one of the most important factors for many car owners. Tesla style recorders not only add functionality to your car, but also fully support factory functions, such as climate control and steering buttons. The control of regular functions of a car, as a rule, is performed on the main screen with the possibility of making those or other changes. It is much more convenient than on any factory tape recorder! Multimedia capabilities of this radio allow you to connect any flash drives with a capacity of up to 1 TB. Now you can safely abandon the Internet, connect your flash drive to the USB port and enjoy watching your favorite movies! If you want to always be online, use your phone as an access point to always be aware of the latest events. Tesla style head units are made based on the Android operating system. This provides the ability to install a huge number of not only various applications, but also navigation systems. A huge number of personal settings that can be customized exclusively to your liking will not leave you indifferent! The quality of the head unit can give odds to any standard equipment of the car, and the visual changes will take you to a completely new car, which in its functionality is not inferior to the new models. The buttons are no longer in trend, use touch controls to control all the functions of your car. Technologies always go forward, opening up all new, unimaginable opportunities. SMARTY Trend is developing together with you to provide our customers with not only excellent service, but also to meet the latest trends in the world of technology. As R. Buckminster Fuller said: Humanity always creates the right technology for the wrong purpose!